Second thing is a silent dropping of all IP Logger plugin data if you deactivate it. Version 3.1. acts in the same way, but you have the “IP Logger Analyzer” (IPLA) tool now to download all plugin data and analyze it locally. 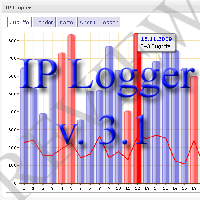 Just do not forget to do it before you decide to deactivate IP Logger plugin. Conclusion: Plugin author M. Retzlaff is opened for the fair suggestions and works hard to make his plugin better and clear to plugin’s users. Well done! This entry was posted on Tuesday, May 4th, 2010 at 20:55	and is filed under WordPress. You can follow any responses to this entry through the RSS 2.0 feed. You can skip to the end and leave a response. Pinging is currently not allowed.